It was the beginning of a magical era. Disco was just about dead, and music was being reborn. Things started rocking again. Although people may have kept on dancing, they also started listening to the words. At this time, New Yorkers in the know were quite keen on three lively talented singer-songwriters who also knew how to rock: Bruce Springsteen who was only playing live because his recording career was stuck in a legal mess; England’s Elvis Costello whose debut record was just hitting the American shores; and Graham Parker, another Brit who had just put out a brilliant sophomore LP, Heat Treatment. Like Bruce’s E-Street Band and Costello’s Attractions, Parker had his Rumour, a collection of veteran musicians that were as important to the mix as were his lyrics and vocals. Those were the days when backing bands meant as much to us fans as did the front man. We knew the names of each player along with their musical pedigree. Parker’s outfit was headed by guitarist Brinsley Schwarz whose namesake band were kings of the pub-rock circuit. GP’s one-time producer Nick Lowe was also a former member of the Brinsleys. What happened after GP’s set stands out most in my faded memory of this show. Although headliner Thin Lizzy had just released their career record, Jailbreak, which featured the radio-friendly “The Boys Are Back in Town,” there were a lot of folks there just to see Parker—myself included. Somehow Lizzy just didn’t meet our cool factor. You see, back then, this whole Punk / New Wave thing made a lot of us act like musical snobs. A band was either hip or not, and there was no in-between. After the intermission, Thin Lizzy came out storming amongst a burst of smoke and flash bombs that put an astonished look on most of the faces down in front. So during the second song, a steady stream of Parker fans, me included, began to exit the venue! It was certainly enough of an exodus for the band to take notice. Looking back, I wished I would have stayed since I later took a liking to the Jailbreak record. I felt even more remorse when I found out that in April 1978, Thin Lizzy front man, the late Phil Lynott, played bass with Elvis Costello, filling in for a wounded Attraction Bruce Thomas at The Roundhouse in London. What a musical snob I was! If the angry young man Costello didn’t have a problem with Lizzy, then I certainly shouldn’t have! I recorded thin Lizzy that day. I dont think i recorded GP. 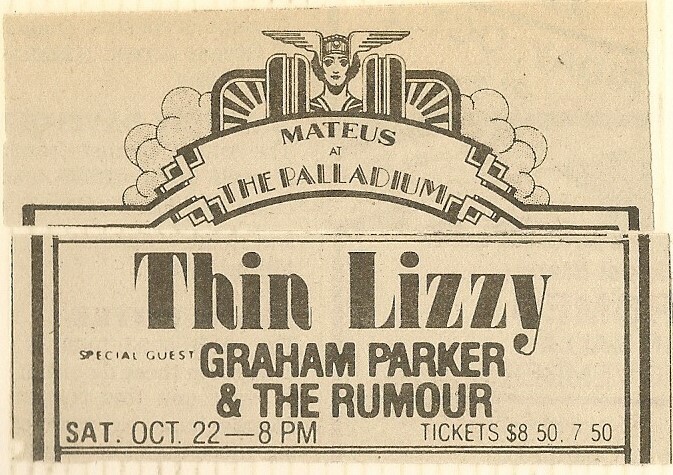 I saw the same tour in Chicago, only I was a huge Thin Lizzy fan and only mildly familiar with GP. Graham Parker could have been the headliners that night, they were so good I became an instant fan. Then Lizzy came on and put on an epic show, it was a concert two-fer one!